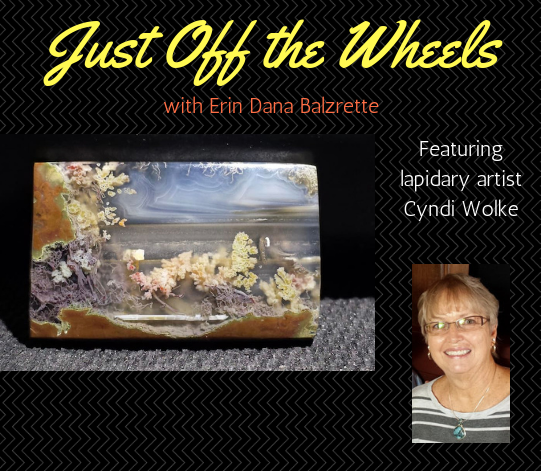 Cyndi Wolke's exceptional lapidary skills and ability to find the beauty in every stone shines second only to her amazing warmth, intelligence, and kindness to everyone she meets. She sees the best, the promise, and wonder in all things, which comes through not only in conversations with her but in seeing stones through her cabs. 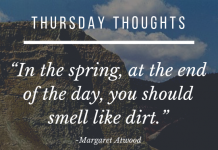 It is always a pleasure speaking with Cyndi Wolke, as you’ll see here. Erin Dana Balzrette: What type of material did you use, where did you find it and what drew you to it? Cyndi Wolke: This cab was cut from a Priday thunder egg. I love the surprise of cutting into a thunder egg because frankly, they are pretty ugly on the outside; kind of like a ‘warty’ potato. Then you cut them open, and it is just amazing the treasure that is hidden inside. We have had the privilege to collect at the Ranch (Richardson's Rock Ranch) in Oregon where these amazing eggs are found. This particular egg was not self-collected. But I still have some that we collected and am excited to see what treasures they hold inside. 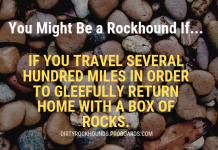 CW: I have been a rock hound since I was a child growing up in Idaho. My family did a lot of camping and fishing, and I always came home with a bag full of treasures that I had collected. About 18 years ago, Dan and I made a trip to Deming, New Mexico to visit Rockhound Park to dig for geodes. We had a great adventure there and were hooked with the thrill of the hunt. We joined the Vallejo Gem and Mineral Club and learned how to cut and cab our finds. Dan does all of the heavy lifting, cuts the slabs and gets them all cleaned up for me. I do all of the cabbing and finish work. 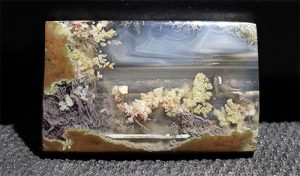 I love finding the best picture in a slab and cutting it to make a beautiful cab that someone can set in jewelry to enjoy for a lifetime. EDB: What creative process do you use when creating cabs? Is there a special technique you used when creating the piece featured? CW: When I pick up a slab, I first examine it for fractures. I mark these in pencil, so I know to avoid these areas when cabbing. Then I look for the best area of the slab that speaks to me. I turn the slab over, upside down, and all around. Some people would laugh at me, but I really study the slab to figure out where I want to cut my first cab. I always go for the best picture that I can find. Then I mark out the frame around the cab with an ultra-fine felt tip pen. I do not want to saw cut into the design that I have so painstakingly captured. Then it is off to the grinding wheels to refine, dome and polish. CW: The newest cabbing approach for me has been the Nova Wheels. I love using them and the beautiful finish they give the cabs. My set up goes to 50,000 Nova, and it gives a glass-like polish to my cabs. EDB: What advice would you give to new lapidary artists? CW: I tell new artists to be patient with themselves and their cabs. It is not a process that can be rushed. It is methodical, and you just can’t skip steps. I also tell them that if their stone breaks during cabbing that there is a reason, and to not throw out their work. Instead, look at it to see what can be made with what is left. Sometimes my best cabs have been what I call “Shape Shifters!" CW: My favorite part of the process is hard to pinpoint. I love being out hiking and hunting rocks, out in the fresh air and nature. I also love the grinding of the cabs, and anticipation of the finished stone. I just love the whole creative process! I also find great happiness in seeing my stones ‘get all dressed up,’ by the many talented silversmiths and wire wrappers. I like the sense of community and the many relationships that have been built through the whole process. 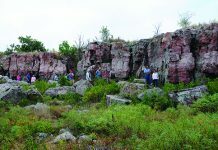 Clubs and Sponsored Shows: Vallejo Gem and Mineral Society; gem and mineral clubs throughout California - part of the California Federation of Mineralogical Societies, and the American Federation of Mineralogical Societies. 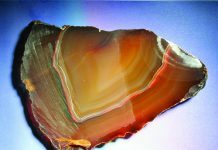 It's also likely you'll find the Wolkes at the gem and mineral shows held in Quartzite, Arizona, among other locales. She is a long-time rockhound and a GIA AJP. To view more of her work visit www.tcstones.com.